MYRIAM AND MARK PASTERNAK raise pigs, wine grapes, rabbits, and horses at their farm, Devil’s Gulch Ranch, in Northern California. Mark bought the steeply hilled ranch in 1971 with his earnings from working in a record store. Meatpaper homed in on their rabbitry. We first spoke with Myriam, who, as a veterinarian, manages the lives of the rabbits, and then to Mark, who handles their afterlives. How did you begin raising rabbits? MYRIAM: My mother is French and she grew up raising rabbits. Her mother and grandmother raised them in the backyard. When our kids were little, we raised them for 4H and for a little meat for the family, and it evolved from there. It went from around 3 to 10 to 1,700 rabbits. How long do rabbits generally live? MYRIAM: Their fullest biological potential is about 10 years, but in the wild, they last about one to two years because of predation and disease. They get eaten. My oldest is four years old. MYRIAM: They get to be about 10–11 pounds, but the fryers that go to market are five to six pounds. MYRIAM: I use three meat breeds: Rex, Californian, and New Zealand. I had access to the breeds, so I used a variety to counteract inbreeding. In Europe, you can buy a barnful of rabbits, but here there just isn’t that kind of quantity. We breed 30-35 rabbits every week and process about 100 per week. They breed like rabbits and they die like rabbits. The gestation period is 30 days, and they wean an average of 6-8 bunnies. There is a lot of management; they contract pasteurella (1) and staph infection quite easily, and stress can kill them. You really have to work at it to stress out a pig. With a rabbit, you can look at it cross-eyed and it wants to die on you. 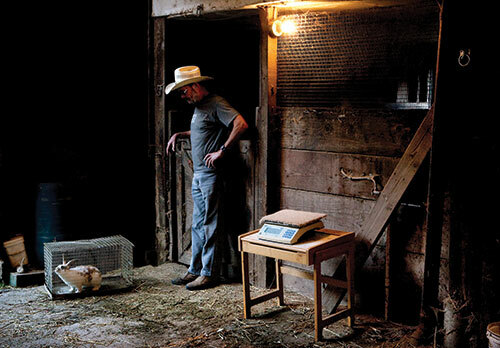 What are the daily duties of a rabbit farmer? MYRIAM : We have an employee now that does the daily maintenance, but it’s mostly feeding and cleaning. The cages are designed so the feces falls through the cracks, but he makes sure that none of it builds up because the rabbits are susceptible to coccidian. (2) They will eat their feces and contract coccidian and then get diarrhea, which can kill them. He also makes sure they have water. On Saturdays, we take out the fryers that are ready. MYRIAM : An alfalfa-based pellet we helped to develop with a feed store. They eat that after they wean at six weeks. You have to keep an eye on them; some rabbits need a higher-protein diet. Rabbits are crepuscular, which means they are more active at dawn than at dusk, so that is when they like to eat. They are also pseudo-ruminant. So they will eat the pellets and then they pass “night feces,” which they re-eat, and it is full of all the good enzymes and fermentation; then when they pass it a second time, it is the little round stuff we recognize as rabbit poop. Have you noticed an increased interest in rabbits? MYRIAM : Oh yeah, about once a month I get asked for breeding stock for someone that wants to start a backyard operation. They’re great to raise. We are teaching people in Haiti to raise them right now. I was in the Peace Corps in the ’80s and fell in love with development work. I was in Niger from ’83 to ’85 during the We Are the World Tour and the terrible drought, and people were raising money for projects, but I realized if people can’t feed themselves, then nothing else matters. So now I work as a consultant for Makouti Agro Enterprises teaching farm management. It has been three years since we started a program with Partners of the Americas, and backyard production has increased 300%. In the beginning, families were raising them to sell, but now they are eating the rabbits at home too. Animals are very important. People depend on them as tractors, as water bearers, as piggy banks, and as food. What makes them so suited for sustenance and production farming in Haiti? MYRIAM: They are very nutritious. They are higher in protein, lower in fat, and lower in calories than chickens.They are also high in zinc and lysine. They initially don’t do well with heat and rain, but they can adapt. They raise rabbits in Texas. But they need to be kept cool; males can go sterile at temperatures above 85 degrees. You can use fans and misters or keep frozen water bottles in their cages. They cool themselves with their ears and throats. Do you know of anyone raising rabbits commercially in pasture? MYRIAM: I don’t know anyone who has been successful. You can cage-raise the young and then put them on grass, but you would have to move them every day because the coccidian stays on the soil and they will eat it. Also, rabbits will fight; they are very territorial. Young rabbits fight right before an earthquake. MYRIAM: They are very sensitive to weather. I don’t know if there are studies being done, but they are always very erratic before a large earthquake, anywhere in the world. Does killing something so adorable ever bother you? MYRIAM: I tried being vegetarian, but that didn’t work, so I decided to take responsibility for the meat I eat. I name my breeding stock and I picked different color breeds, so they are all distinct to me. People say you shouldn’t name animals you are going to kill, but I think they deserve a name. There is “the Bunny Factor,” but I don’t think just because something is cute it should be eliminated from my diet. What are some of the rabbits’ names? 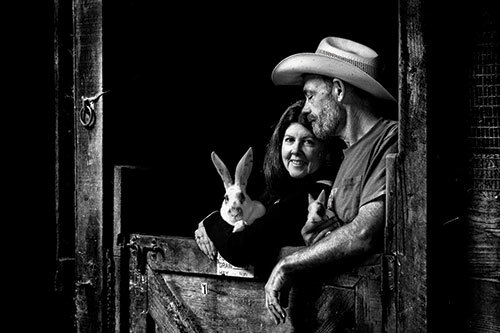 MYRIAM: Shazzam, Bindi, Opal, Freckles, Curry, California Smile, Canyon, Indiana, Bun Bun, Mr. T.
We then spoke to Mark Pasternak about the work of bringing rabbits into the food system. MARK: Rabbits can be inspected by the USDA, but it is voluntary, so you don’t need a USDA stamp to cross state lines with them. They are considered poultry and they are required to be state-inspected for resale. The most common way to kill them is cervical dislocation, which means twisting their neck. Or bonking the rabbit on the head, then slicing the neck. There’s also CO2, but I’m not convinced that’s more humane. Rabbit blood has different grades, and sterile blood is worth more. Rabbits are used more for lab work than they are for meat. Rabbits raised for lab work can be bled off four or five times in their life. There are rabbitries with 1,000 does that are injected with a virus so they will produce the antibodies that can then be used. Our rabbits are mostly sold wholesale and at the farmers’ markets. You also raise pigs. How do rabbits compare? MARK: Pigs are much better moneymakers, and rabbits are so fragile. You really have to work at it to stress out a pig. With a rabbit, you can look at it cross-eyed and it wants to die on you. They have a 20% mortality rate. Once you wean them, or even after three weeks, the mortality rate is not so bad. But there is a lot of maintenance. On top of that, the feed is really expensive. They do have pretty good feed conversion. I know rabbits are in very high demand and short supply for restaurant chefs. You are responding to this by increasing your rabbitry significantly. MARK: The reason we are expanding is not that the rabbits are particularly making us rich, but there is such a demand that I can knock on the kitchen door of any restaurant and say “I’m Devil’s Gulch and I sell rabbits,” and they will welcome me in. It would be hard to have the name recognition we have without the rabbits. Plus my wife raises really good rabbits. How is rabbit usually prepared? MARK: There are millions of rabbit recipes. I grill it a lot because it is easy. It is a very sweet meat with a reasonable texture and an elegant, subtle flavor, so it lends itself to any sort of sauce. Do you eat rabbit every night? MARK: No, I have restaurants that are screaming at me for them, so I can’t afford to. (1) Pasteurella is a bacterium known to cause morbidity and mortality in rabbits, and the predominant syndrome is upper respiratory disease. It can be endemic among rabbit colonies and is often transmitted through nasal secretions. (2) Coccidian is a parasite that attacks animals’ intestinal tracts. MARISSA GUGGIANA is the author of a love letter to America’s butchers called Primal Cuts. JULIO DUFFOO was born in Peru, raised in Brooklyn, and is now based in San Francisco. He has photographed people who spend their lives engaged with meat for every issue of Meatpaper since Issue One.